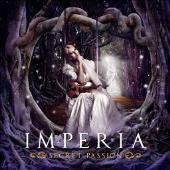 Third album from Finish/Norwegian epic Gothic combo IMPERIA has hit the streets. Containing bombastic, operatic vocals, trigged drums and speedy power metal guitars perhaps? This is not the most varied genre. “Touch of Your Hand” does not stray very much from my guess. Helena Iren Michaelsen has a fine voice and a lot of passion in the words. She has a past in TRAIL OF TEARS and her solo project ANGEL. The orchestral parts are done by Oliver Philipps, and Tina Guo handles the cello. The whole shebang is is mixed and mastered by Jacob Hansen. Remove the keys and the enhancements of orchestral character and there wouldn´t be a whole lot to talk about here. And when Helena starts impersonating Birgit Nilsson quite frequently this is pure humor. The title track is less complex but has a genuinely well-crafted refrain. “Suicide” is a faster and heavier piece, which the album needs. And the possibly intended mix that the band is aiming for succeeds all the way in “Out of Sight”. The power ballads “Let Down” and “Hold On” are tailor made for the band, very impressive. But they should opt for a different direction than being an opera singer with a band as in “Fragile” and “Greed”. This album could do with a boost of the fine sides mentioned above, since the competition is fierce. But the main abomination I have saved for last, as has the band. The bonus track “Mistress” is nothing else than an obnoxious attempt at Eurodisco… which is hereby banned!